Sign up for a Catalog today! Woody's Hot Rodz specializes in 1955-57 Chevrolet. Our industry leading catalog is packed with quality products for your Tri-Five Chevy. We offer name brand products, like Danchuk, among many others. 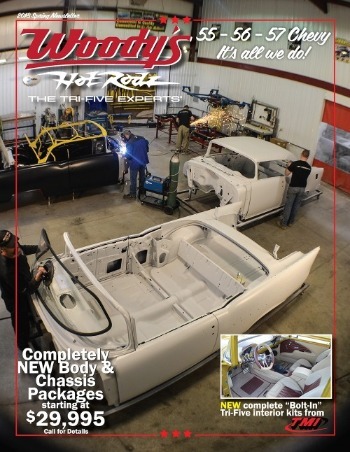 If you own a Tri-Five or are thinking about restoring one, the Woody's Hot Rodz catalog is a must! Woody's is the only place in the world where you can buy a complete turn key Chevrolet Performance Officially Licensed 1955-57 Chevrolet. That's what sets us apart from everyone else, we build these every day. If you have a question, we are here to help. Who else better to answer your questions than someone who builds Tri-Fives every day. Sign up today to get your copy. We'll send one your way for $2 shipping & handling. Catalogs are mailed to US residents only. We do not rent, sell or trade your information.